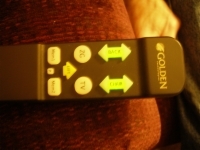 The PR-756LC Relaxer by Golden Technologies is a infinite-position lift chair with many exciting features to offer. The high quality craftsmanship is evident in design with the optional tranquil heat & massage, 4-pillow back cushioning, and removable back for ease of cleaning. The infinite-position recliner is perfect for relaxing, watching TV, or snoozing away for a cat nap. If you require a lift chair where the ottoman needs to be elevated higher than the back, then the PR-756LC Relaxer is the chair for you. The PR-756LC Relaxer comes standard with head covers and improved filler 4-pillow backing for supreme comfort and long lasting durability. 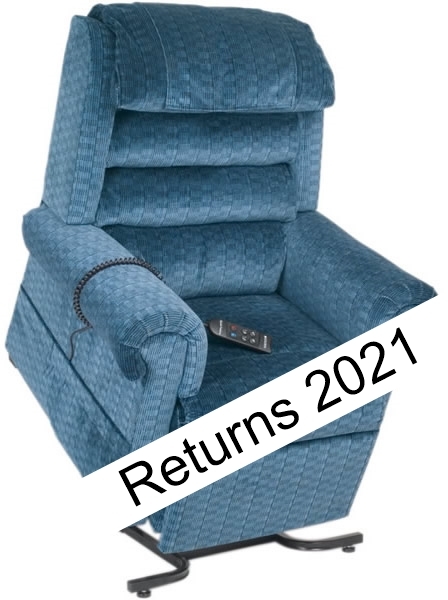 Several exciting features you'll find in the PR-756LC Relaxer lift chair include improved filler 4-pillow back cushioning, and an integrated battery backup on the lifting mechanism in case of a power outage. The PR-756LC features a patented quiet and smooth operation with stylish designs to add to any home decor. 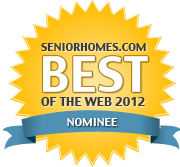 Keith from granada hills, california would recommend this to a friend. Poor backrest frame design. I had a bolt break around 8 months ago. I replaced it. Today,the entire wooden frame split and another bolt broke. It took 10 hours to re-glue, nail, and put the bolts back in. Also,even though the electronics are great, the chair lifts too slowly. If you had to visit the bathroom, by the time it raised high enough to get out often its too late. Delivery was fast,and they showed me how to use the chair.I haven't used the service yet so we will have to see if they if they can function in that area. I noticed this chair has a lifetime warranty on the frame. Next time it breaks I'll see if I can have the backrest frame replaced. Testy from Lockport, IL 60441 would recommend this to a friend. 83 year-old widower with the usual elderly medical problems. Easy to use controls, provides the sought-after zero gravity position to relieve arthritic hip pain. Color/fabric meet desired qualities. Noisy, rough jerking of chair when changing positions. Cushions too firm for a 200 pound occupant. Difficult to move on a carpeted floor. Needs casters or some other appliance. Driver unloaded and placed inside the garage. No transit damage noted. D from Inland Empire from Ontario Calif would recommend this to a friend. Great fit, I'm 6'4" 275lbs, the larger chair is worth the added cost. The infinite positions allow me to find the most comfortable position regardless of what hurts at the moment. The standard fabric feel like it should last a long while. I wish there was a larger selection of standard fabrics. Delivery was actually early. Awesome service as well. I emailed Katie on a Monday about a pop sound when the chair would rise. I recieved a call from the factory with the tech's name. By Wednesday at 1pm the chair was fixed. Turned out to be a little plastic piece that needed some staples. I couldn't believe how fast this issue was resloved. I don't think any chain store could do better. Awesome customer service and great pricing. I highly recommend buying from Katie Ryther katie.ryther@inetalliance I'm a stickler for good customer service and Katie is top notch. PR-756L Golden Lrge Lift CHair. Lee from Florida would recommend this to a friend. This is a great chair my husband had a stroke and this chair was purchased so as to elevate his legs and feet to keep fluid retention down as much as possible. He loves the Chair we have had it now for a month. 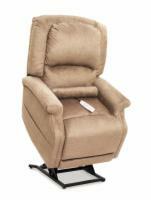 Golden Relaxer PR - -756L lift recliner - good purchase! Lou from Green Bay from Green Bay, Wisconsin would recommend this to a friend. Chair is for my husband, who is 5'9, regular build, and 62 years-old. I ordered the heat and massaging options. We like how the foot rest and the reclining work independently of each other. Reclines back like a bed. I chose the navy blue fabric and I'm very happy with the color, fabric, and headrest cushions. As I'm writing this, my husband is asleep in the chair. Will need to think about getting one for myself, as it's very comfortable. As of today, no cons for this purchase. Finally found a lift chair for my long legs. Goldilocks from The Garden State would recommend this to a friend. This Golden model's, long length, accommodates long-legged individuals better than any other lift chair I've tried. The controls are easy to use with convenient one-button choices for my shaky hands. The design is more modern than most models and the stock color is surprisingly rich looking! I was perplexed at struggling to find a chair long enough for my 5'11" frame without my ankles uncomfortably hitting the end of the foot rest. EUREKA - FINALLY - Golden's 756L fits the bill for me. Hundreds of dollars less than local dealers but I do recommend you try before you buy! Blacksmith Anvil Collector from Monticello, Florida would recommend this to a friend. The only "con" was my fault - I ordered a chair much too large for me, but everyone helped tremendously in making an exchange for the more comfortable chair that I needed. Delivery was prompt and satisfactory on both chairs. And the pick up of the one I had to return was also prompt and satisfactory. I am very pleased with my lift chair. Everyone, especially the salesteam, was very helpful in making the exchange from the first one I ordered which was much too large for me.